This Sabrent hub is an external USB 3.0 combo which combines USB 3.0 hub with super speed card readers. 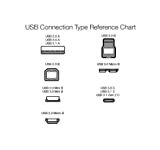 The USB 3.0 Hub adds three USB ports to your Mac (or PC), allowing you to connect USB devices such as digital cameras, phones, external hard drives, flash drives, and printers to one convenient place. Its sleek aluminum design the perfect complement to your Apple computer and products. It does not require any software or complicated installation process. With a slim design, it saves you precious desktop space. It's extremely portable and easy to move between systems or take on the road. Please Note:2.4Ghz wireless devices, such as wireless keyboard and mouse adapters, may not work in close proximity to USB 3.0 devices or hubs. Connecting to a USB 2.0 port is recommended. 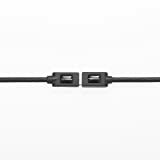 For a stable connection, the devices connected to the 3-Port USB 3.0 Hub must not exceed a combined current of 5 volts 900 mash. External hard-drives should be connected to an external power source. This 3-Port USB 3.0 Hub will not charge an iPad (it will only sync). Usage Tips 1. The device can read one card only in either slot every time. 2. It is recommended to remove safely after connection. System requirements: Mac OS 9.1 & higher. Windows 98SE /ME /2000 /XP /Vista /7/8.Linux 2.4 or above Package contents. USB 3.0 3-port hub. Warranty: This product comes with a one year warranty. In order for us to properly assist you, please follow these simple instructions: Go to .sab rent/support and click ‘Submit a ticket’. Submit your ticket. You must include your Order ID# number in the subject line. 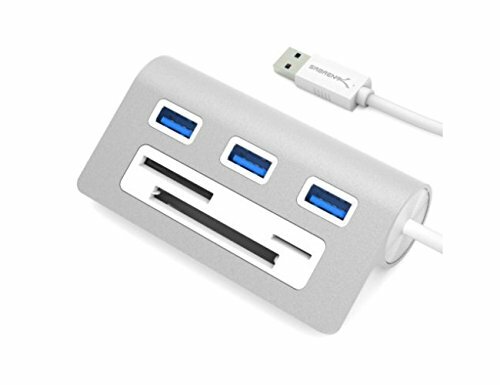 This product, Sabrent Premium 3 Port Aluminum USB 3.0 Hub with Multi-In-1 Card Reader (12" cable) for iMac, All MacBooks, Mac Mini, or any PC (HB-MACR), is currently discounted at 56% off! We don't know when it will go back to its original price so order now to secure it at this price! We'll make sure to order it immediately!